Yang Rong participated in the Chinese reality show I Am The Actor where contestants are judged for their acting skills. She's been working in the entertainment business for a long time and she is now 30+ years old. 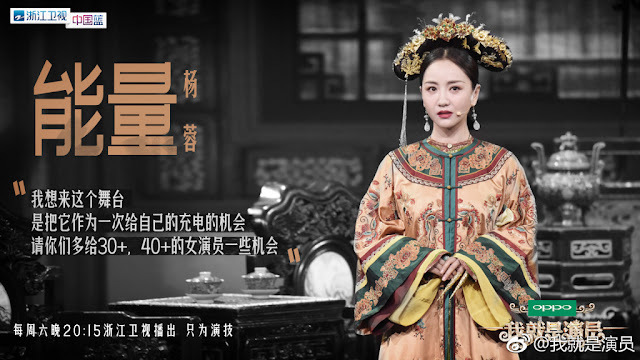 Standing on stage, she used the opportunity to make a request to the 3 judges - Xu Zheng (actor and director), Zhang Ziyi (actress) and Wu Xiubo (actor, producer and musician) - to give actresses in their 30s and 40s more opportunities. This is a cause that is close to her heart since she wrote a heartfelt post about the same issue months earlier. 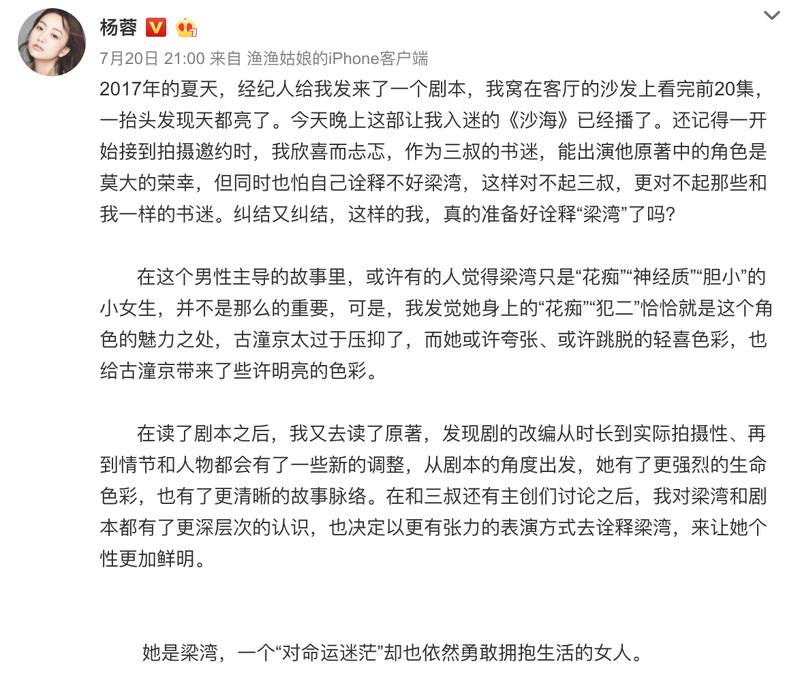 She recounts an incident in the summer of 2017 when she received the script for Tomb of the Sea. She was afraid that she wouldn't be able to play the part of Liang Wan successfully and end up disappointing her favorite author Nan Pai San Shu. She also feels that people might be find her career path hard to understand. While some actresses of her generation have begun playing mother roles, she's still playing "young roles". It's not a matter of the fear of getting old but a fear of an industry that does not allow actresses to mature into older roles. She shares that actresses who are in their 30s do not love playing younger roles because they want to or love to but more so because the market needs for them to play the part. She's eager to play challenging roles like a mature woman who can't get married or a single mother whose life is full of challenges. She admits she is already a middle aged actress which is similar to another actress that she admires. This actress is famous and pretty but does not have any projects so she worries about herself since she says she is not as famous and not as pretty as this other actress. So Yang Rong is extremely thankful forTomb of the Sea because it gave her a chance to do a meaningful role which gives her strength to be braver. Brave enough to face her feelings head on. Asian people are stereotypically known to look young for their age. It is a blessing and a curse at the same time. Yang Rong is only 37 years old. Heck, I am older than her by a year and I wish I looked as young and fresh as her. This is not a problem that's limited to the Chinese film industry. Hollywood has been dealing with this issue for quite awhile now and we don't see any significant changes as of yet. For some reason, this is only plaguing actresses and not their male counterparts. I am glad she's spoke up on a national platform to bring attention to it. There might not be any immediate change but if more people speak up on the issue like she did, change will eventually come. So Yang Rong, you are brave! I first saw her acting in Memory Lost. And I thought she nailed her character! Despite the age difference between her costars, she didn't give off the "forced" feeling that I would experience sometimes with other actors/actresses whom been wrongly cast-ed. I'm actually quite proud of her for speaking up on such issues from the entertainment circle! You go girl! Agree writers these days need to write things about mature women too and not just the cute ditzy girls who are not even 18 in the very least, but 16?? I never find Sun Li and Liu Tao (used to be a young girl though) as the young tiny little women. They were able to act as mature women pretty well, or even if they try to play young roles they just come off as mature women without annoyance. Hope Yang Rong will get opportunities like them too because she has the potential to. The ageism in Asia annoys me to no end. I recently turned 41 and noticed that in the dramas - the roles of my women my age are bound to stereotypical roles: mother, spinster or crazy lady. 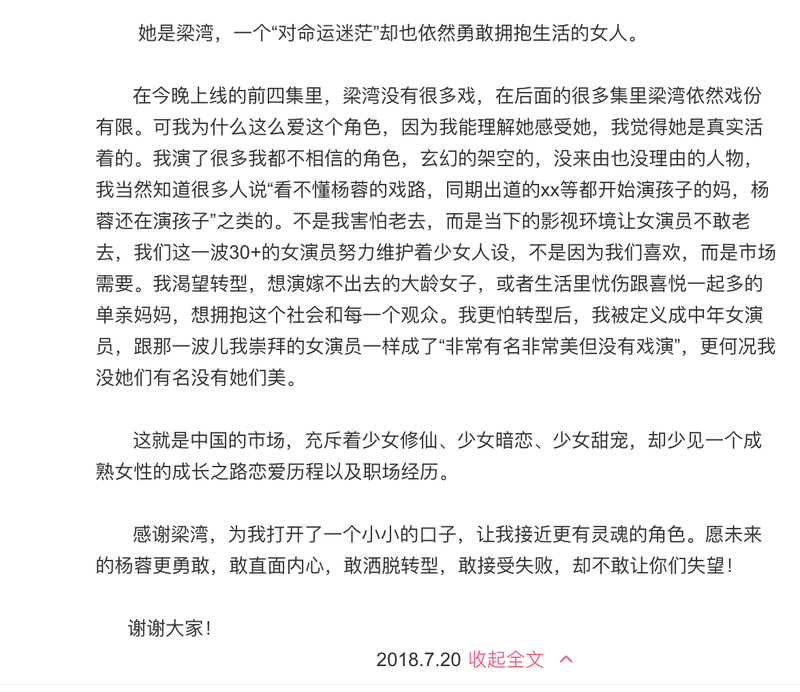 Wish drama shows will reflect more the current reality of being a woman today. A complicated role - like a single mom working hard balancing her career and taking care of her family etc. I enjoy dramas with veteran actors and actresses such as In The Name Of The People, First Half Of My Life, etc. bec the acting is much much better than idol dramas. Actress Liu Tao has started to play mother roles such as in Advisors Alliance. I agree with the previous comments, and have nothing to add. Since I watched the video, is it possible to summarise her role, what she did, and how she was judged? Also if there were any reactions from the others on her words. Thank you very much in advance!! I think Yang Rong is one of the few actresses who can nail cutsey characters without looking forced, but at the same time, I'd wish she would get to play her age in non-stereotypical roles because she has the talent. Yes she is very good in cutsiness and really funny role naturally. She can be a good comedian. She is good at mean serious roles too. 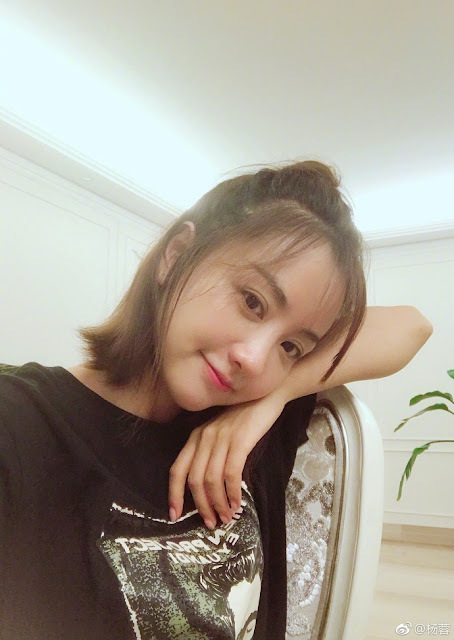 Back in the old days she did a drama with Deng Chao that I haven't watched, but it seems she did well as a shy-ish girl too. She has lots of ranges, not the prettiest but very likeable. A shame that the industry doesnt create roles for women on their 30's. Just look at the most popular TV celebs in their earlier 30's Zhao Liying, YangMi, Tang Yan, etc. They usually play characters that are fairly young. It does feel like the industry keeps forcing a lot of celebs to play younger characters while not providing opportunities for more mature characters. 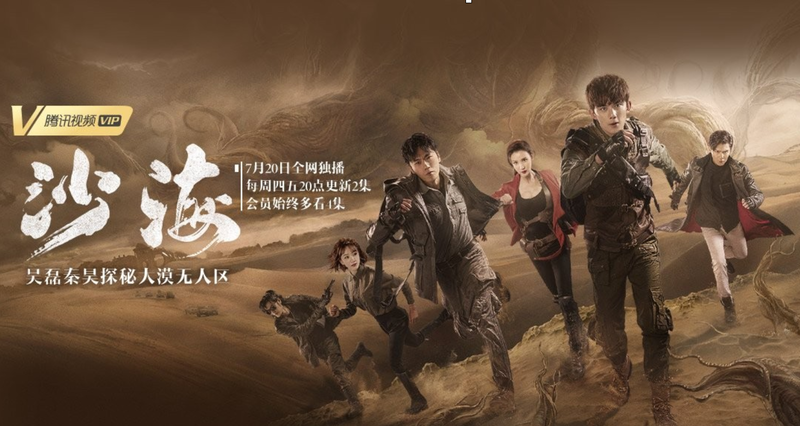 I wonder if it is in large part related to IP dramas. A lot of IP source material have very young characters, in their teens, but actors are much older. While I do think actresses have a bigger issue with ageism, I have to say I find actors playing a really young character a bit off putting sometimes. Top of my head HuGe in The Disguiser. He was pretty old but he was playing a "fresh college student" it was hard to stretch my imagination to that point. I hated Yang Rong in Lady and Liar! Then I watched Memory Lost, saw her face and instantly recognized her. I didn't want to watch Memory Lost because I hated her in Lady and Liar but the story was so gripping that by the end of the first episode, I was hooked. From there, I just grew to like her even more. I love actors and actresses who could act like a real person! Not those high school dramas with beautiful leads who could not even act with walking.